Thursdays drawing project is coming along – today was spent in starting the beginning development of the pine trees in the foreground, as well as . 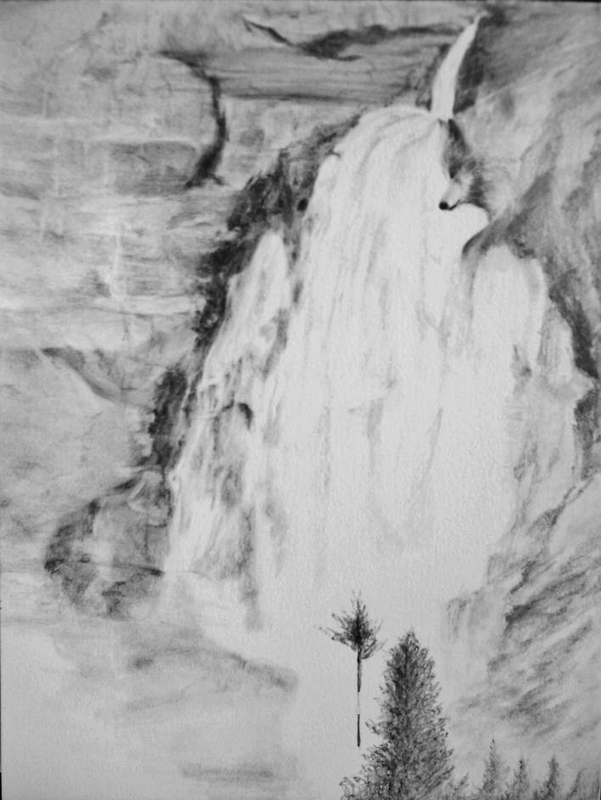 . .
Takakkaw Falls is a graphite drawing (12×9) on Bristol Vellum paper using 2H and HB graphite pencils. A tortilium and a kneaded are two tools being used to move and blend the graphite. As mentioned the pine trees are just beginning to show, mostly they will be developed with squiggly lines, a tortilum to blend, the kneaded eraser to kind of blot out sections and then I start the drawing process all over again. It’s a way to draw full pine trees with some depth and in this case they need to come more forward than the slabs of rock. Rocks on the lower-right-side are beginning to be drawn in. The waterfall is starting to take shape as well. Notice the wolf, he has been worked on – taking shape and becoming slightly more dominant to the piece. I decided if he’s going to be in the drawing, might as well play a supporting role. My first time drawing a wolf ~ I think I’ll leave well enough alone. Thanks for checking in. Next week work will continue on the left-lower corner of the rocks and all the foreground trees will be completed. Click onto the image for a larger view. Thumbs up for the wolf. The falls themselves are amazing. Way back when I was in school and had to take art class, I always struggled with making water look realistic. And here you’ve done it and made it look so easy. Thanks for the nod – more to do with the wolf, will be all trees this week. Thank you, but today I saw a graphite drawing of water and it was just amazing. I’ve more work to do in this area. Appreciate your kind thoughts. Great! I always like watching how these take shape. Thanks Mark – this week it will be all about the trees. Hope to get them done and then we’ll be nearing the finish line. Thanks for checking in. Yay, the wolf is still there! I know Resa I couldn’t leave him out – so over time you’ll see a slight adjustment to the Wolf, but his presence will be felt in the piece. Have a great week! Cool right, I guess he knew right when to show up. Thanks so much Amy for visiting and commenting! The first thing I noticed was the wolf. Excellent creation, Mary! The way you executed the texture is divine. Thank you so much Millie – nice to see you!! I see everyone is talking about the elephant in the room. 🙂 oh yes, I think they’ve found it! Thank you Prospero! I like it … and thinks for leaving the wolf there. This is really taking shape Mary. The wolf is intriguing. Oh I do like the trees. And glad to see the wolf clearly present. Hi Gallivanta, thanks very much! The wolf has really come together this week – have a lovely weekend. I’m glad the wolf will stay, Mary! Very nice! This is fascinating…I love the introduction of the trees…..and now I can see the wolf:) Thank you and have a lovely weekend. Janet. Thanks Janet – I need to work on getting the scale of the trees in during my time drawing next week. Great to see that the wolf is showing itself for you. Have a wonderful weekend too! Thanks Sylvia – thought I’d bring him out a little more.